Earlier in the summer, I was privileged to serve on the faculty of the Asian Festival of Children's Content, which seeks to "provide the world’s children with quality Asian content for education and entertainment." AFCC 2014 focused on India, lasted for six days, and drew 938 delegates from 27 countries. I spoke on several panels but also managed to enjoy the sights, tastes, smells, and sounds of Singapore, the third wealthiest country in the world. My first panel was titled Young Adult Books as Windows and Mirrors. Here's the description: "Do books serve as a window to a different life or a mirror for your own? 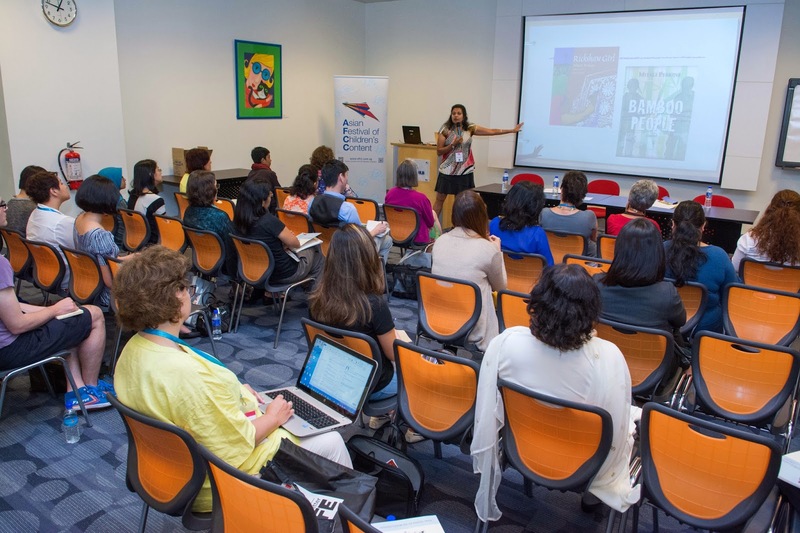 Mitali Perkins and Sampurna Chattarji examine why it’s important that young adult audiences have books that not only provide insight to the lives of others but also serve as mirrors of their own lives and cultures." Next came The Vast Spread of the Sea: Asian Diaspora Writers and the Works, featuring author Gabrielle Wang, Illustrator Il Sung Na, and myself. "In this panel, we ask Asian authors who have worked in the UK, Australia, and the USA to speak on their experiences as creators of Asian descent. What issues, if any, remain universal to the Asian diaspora experience? What challenges have these creators faced and how did they overcome them to get published? Find out!" 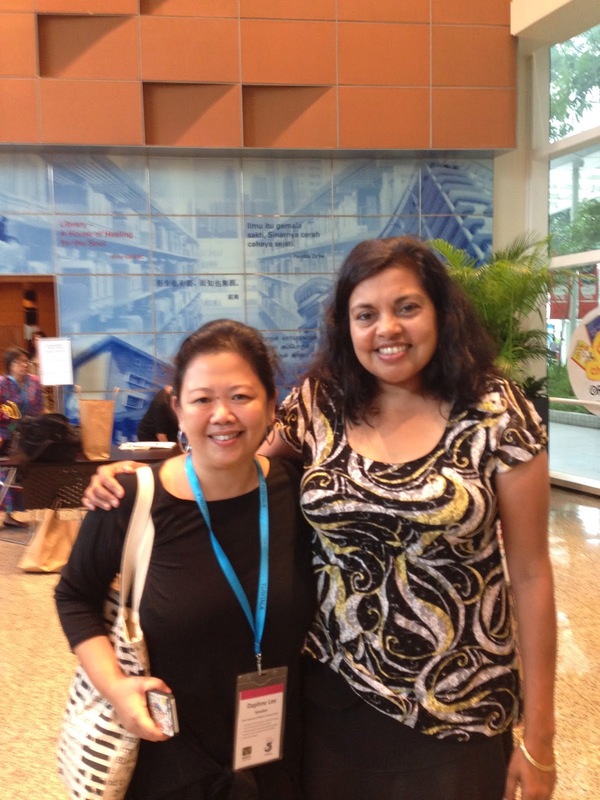 Third and last, I spoke on Writing About Different Cultures with Gabrielle Wang. "As our global society embraces multiculturalism more and more, the question of how to tell effective stories that speak to multicultural communities become ever more important. How should writers, illustrators, and other story creators responsibly address writing about different cultures? Join in the discussion in this panel." 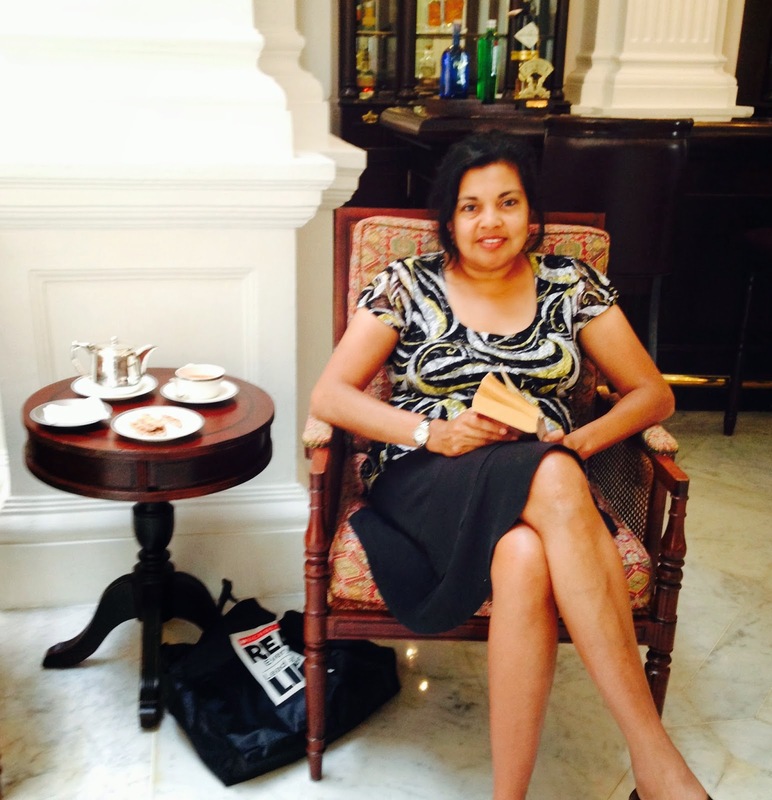 ... and Sayoni Basu, editor with India's Duckbill Books. Editors Cheryl Robson (left) of the U.K. and Sayoni Basu (right) of India talked about acquisitions. Stacy Whitman of Tu Books (center) ably represented North American editors and publishers. My turn to present: "Young Adult Books as Windows and Mirrors." AFCC staff and volunteers were excellent at spoiling us. Many of our "Makan and Mingle" events took place on the top floor of the Singapore National Library, and featured a glorious 360 degree view. 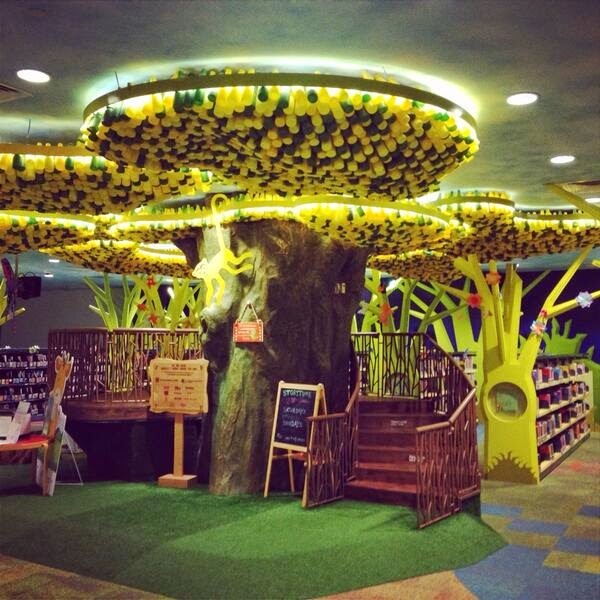 The Children's Room at the Singapore National Library. Bookseller Denise Tan of Closetful of Books organized my author visit to the ISS International School of Singapore. Spoke with 9th graders from many Asian countries about stories between cultures. I always feel at home in a roomful of global nomads and Third Culture kids. 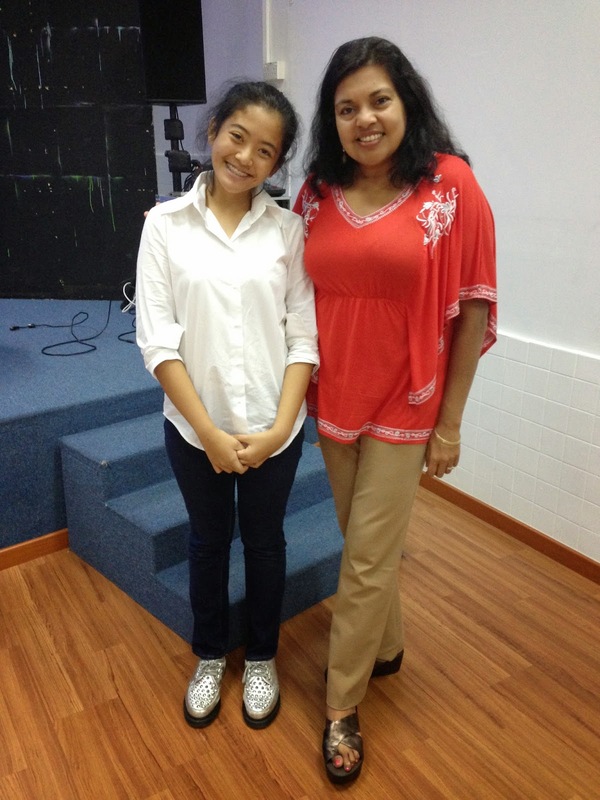 A sweet-faced Indonesian student asked for a picture. Who could say no to that smile? Not me. 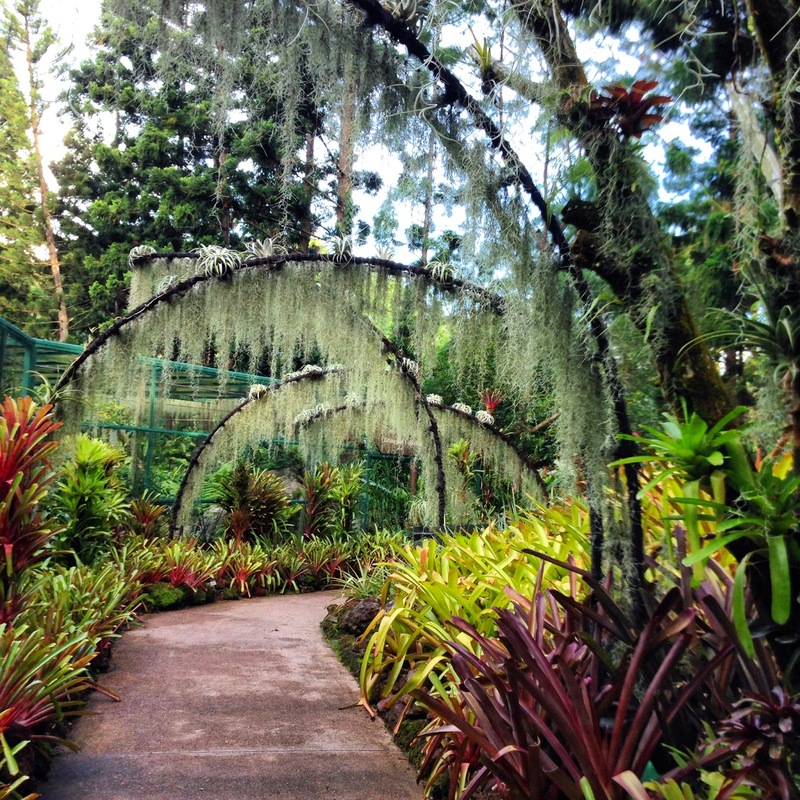 My extracurricular activities included a visit to the National Orchid Garden. At every turn, you catch your breath and squelch a desire to burst into applause, because what will the other tourists think? Oh, well. Go ahead. They've all become flower and fountain paparazzi. 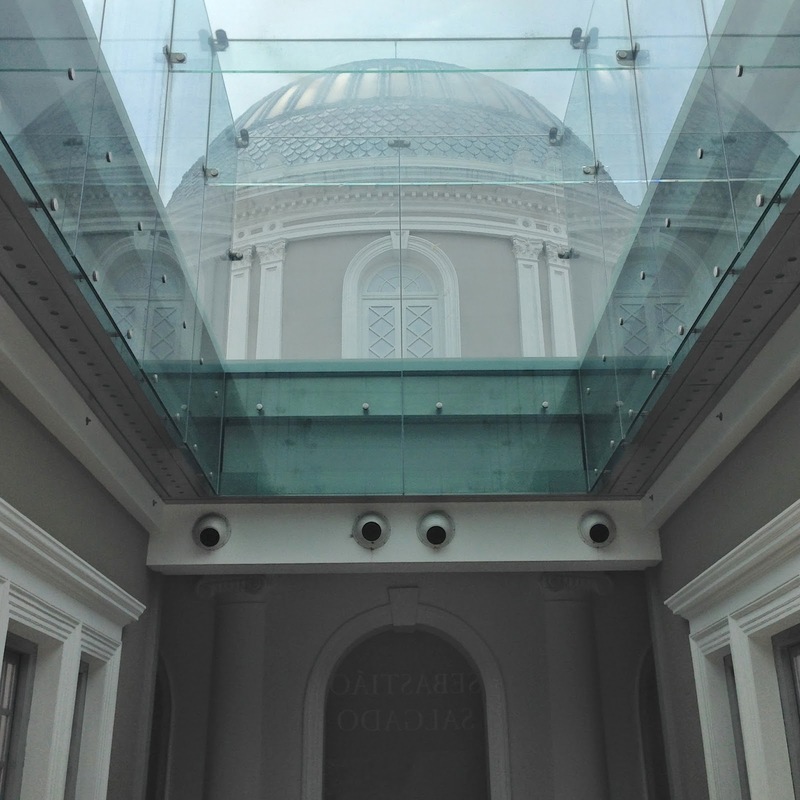 Perk of solo travel: paying closer attention to the symmetry, detail, and elegance at the National Museum of Singapore. A volunteer docent presented an enthralling 2.5 hours of history, full of unforgettable stories from the nation as well as from his own life. "Confucian families sadly didn't honor girl children as much as boys. During the time of hardship after the war, for example, girls were given to Malay families for adoption. One particular Chinese family had three daughters and two sons. They fought hard and somehow managed to keep the family intact, but the girls were not educated while the sons went to school. How do I know?" He hesitated to check his emotion. "Because I was one of those boys." How do you know you're in Little India on a Sunday afternoon? 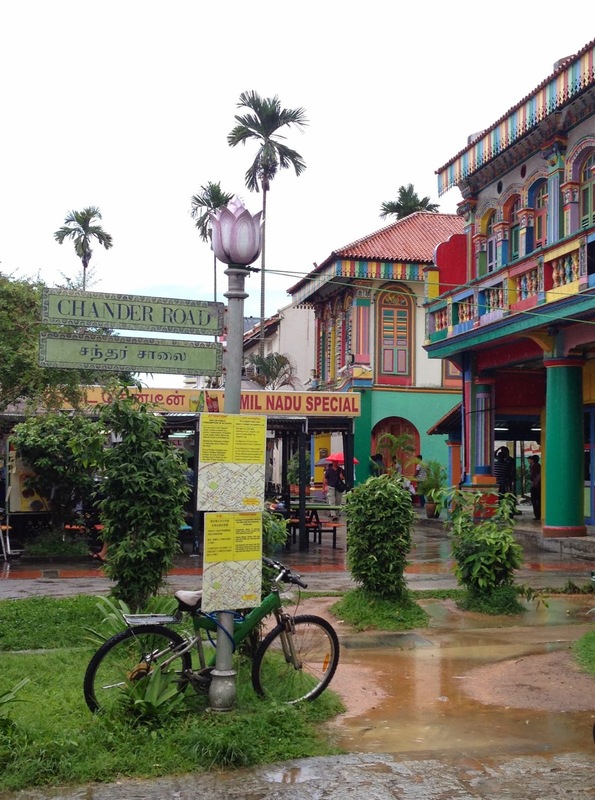 By the monsoon rains, spicy vegetable biryani and sweet lassi, painted windows, and hundreds of Indians, strolling, shopping, and people-watching, just like you. Need a break from the equatorial sun? Nothing better than a good book, a cup of Darjeeling, and biscuits in the Writer's Bar, where Ernest Hemingway and W. Somerset Maugham enjoyed different kinds of beverages. Last but not least, don't skip a moonlit riverboat ride. Glorious! Right, Junko (Yokota) and Marjorie (Coughlan)? AFCC 2015 will be held from May 29 – June 7 in Singapore, and the country of focus is China. My recommendation? Don't miss it!